Day 21 of incubation was on Saturday, Sam and Lis heard some cheeping in the late afternoon but we didn’t think any had hatched. By the evening there was a Cream Leg Bar shell outside of the nest box but no sign of a chick. By morning we had the CLB chick (well CLB x Lakenvelder) and two others, a black one and a yellow one. At first I thought they were from a light brown egg and a dark brown egg, but it turns out that they are both Rhode Island Red x Copper Black Maran. There was also an egg with a hole in it. I had read that intervention generally caused more harm than good so we left it be. We popped some crumb down though as we weren’t 100% certain when they hatched. Evening everything was still the same and I was worrying for the pipped egg but kept my hands to myself. Thankfully when Sam checked in the morning there was another egg shell but he couldn’t see the chick. It turned out to be another black one (RIR X CBM), wobbly on it’s feet but alive. Four chicks out of 7 eggs seemed good to us but we still hoped for the other three. I was keen to get a CBM or a CBM x Cuckoo Maran. We had a mini panic that afternoon as I went to check on them and a chick was outside the coop. It squeezed it’s way back in when I arrived, but not a good situation. 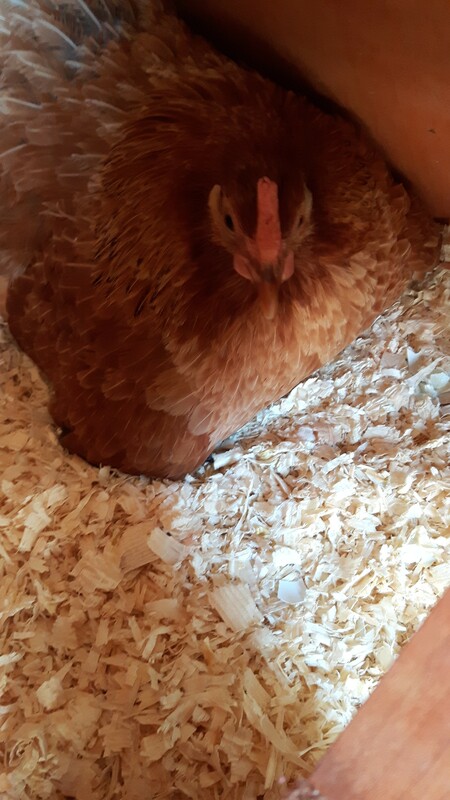 Aino was now sitting outside the nest box with the chicks under her but no eggs so we thought we’d give them a chance by shutting her into the nest box. I had heard tapping from one of the remaining eggs and it would keep the chicks safe until I was able to block off the gaps in the coop. By Tuesday the chicks were all doing well and we’d put cardboard around the edge to keep them in. Aino was adamant that she didn’t want to sit on the eggs. They had been pushed to one corner of the nest box and she was in the other with the chicks. We took the eggs out and brought them inside with a hot water bottle on top of the fish tank. I could still hear the light tapping. Wednesday evening we candled. I saw what looked like feathers but no movement in one egg, and just a dark shadow in two eggs. We gave up on them. I cracked the first one in the sink and it opened with a loud bang and an awful smell. Have had to light some incense in the kitchen to mask it. Another infertile egg, no development at all. The second egg really broke my heart though. I was expecting the same again but I saw black feathers. Then I saw movement. I opened it up and the yolk sack was still very large and hadn’t been absorbed. For some reason this chick was days behind the others. It’s possible it had been one of the eggs on the edge and the lack of constant temperature messed up the development. I held it until it stopped moving, there was nothing more I could do for it. 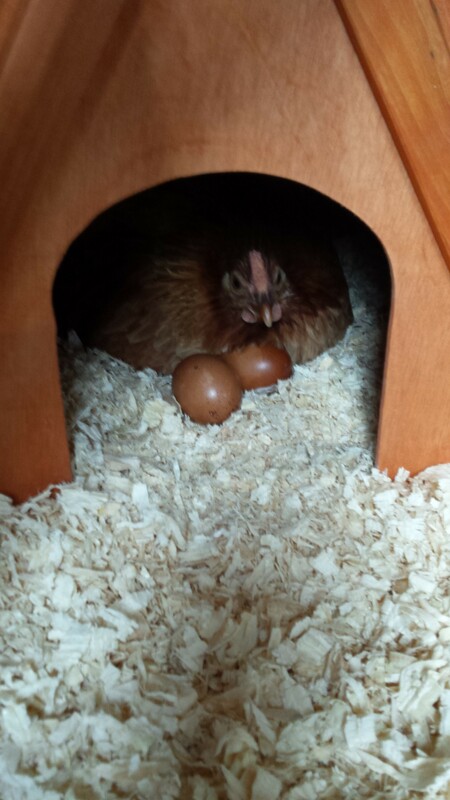 The third egg I was certain would go pop as two of them had just had a shadow when we candled. I saw feathers again. This chick was huge though, taking up the full space of the egg. It still had some yolk sack not absorbed though and it was dead. I guess it was a day or so off hatching when Aino gave up. Maybe these two under developed chicks were from these eggs? A very sad evening, and no doubt my first of many where we lose an animal. If anyone has suggestions of things I could have done to help these chicks I’d be very interested. We’ll be buying an incubator before we put eggs under any other broodies. 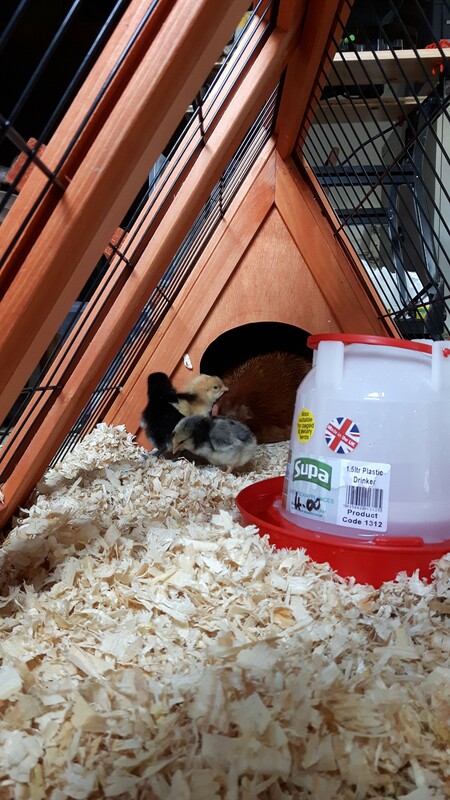 Tomorrow I will go and watch our surviving chicks, try to come up with B names for them and maybe take a video for you all. We have our first new lives and our first deaths in the same week, life has a balance and this is a good reminder of that. Oh PS I finally learnt how to get a subscribe button on here, so you can sign up to get notifications of our updates. That’ll help you keep up-to-date with our antics now I am keeping up-to-date with posting them!